Lightwater Valley Started life as a Pig Farm located approximately 5 miles from the North Yorkshire city of Ripon. The park was originally owned by Robert Staveley and progressed to become a fresh fruit picking farm in 1969 which proved to be immensely popular with members of the local community. The land on which the park currently occupies has been owned by the Staveley family since 1516 when Cardinal Wolsey presented Robert Staveley with the rights and ownership deeds of the land. In 1976, however the area surrounding the farm was severely affected by a drought which inevitably had a detrimental effect on the fruit that was growing causing revenues to fall. In response to this crisis, the decision was made to excavate a large lake to provide the necessary water required to irrigate the farm. It is this lake that currently forms the picturesque scene that greets our visitors from the train and fairground. The park as it is known today was born after the purchase and creation of the Rat Rollercoaster in 1987, which at the time became the world's first and only subterranean rollercoaster. The ride was initially themed as a sewer and riders were led to believe that they were descending down into a sewer where the rat themed cars awaited to take them on their thrilling adventure. This theming lasted until the 2009 season when the decision was made to upgrade the ride and the scenery to that of an abandoned mineshaft that has been taken over by Raptors from the Jurassic period. The ride is now known as Raptor Attack and has been extensively renovated. Following the success of the Sewer Rat, the park decided to embark on a new project to create a brand new record breaking rollercoaster for the park. In the late 1980's Robert Staveley submitted the plans for the new coaster that would eventually be named the ultimate following a public vote to decide the name. In 1996, Robert Staveley decided to hand the park to his children, Amanda and James. The park was managed by James and Amanda until 1997 when Queensborough Holdings purchased the park for £5.6 million. 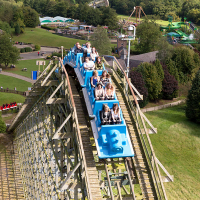 Lightwater valley was the second park owned by Queensborough Holdings with the company also operating Pleasurewood hills Near Lowestoft in Suffolk. As a result, both parks essentially became sisters to one another and the mascot of Woody the Bear was adopted. The Parks were operated by Leisure Great Britain, a subsidiary of Queensborough Holdings for 11 months before the company decided to sell Lightwater Valley. The park remained for sale for a few years but no offers were received. Lightwater valley was bought by Ball investments in 2001 and passed to be under the management of Heritage Great Britain. It is under this management company that Lightwater Valley operates today. It was under the initial marketing rebrand of the business that the "valligators were born. A mixture of half alligator, half human, the Valligators are the park's unique mascots named Harry, Sally and Little Al. It is almost certain that where there is mischief and chaos, a Valligator is behind it. The Ultimate" was designed and built as a result of cooperation between the Park's previous Owner, Robert Staveley and Big Country Motioneering. The project cost £5.2 million and construction work was commenced in early 1990. The Ultimate took eighteen months to build and test and was opened to the general public on 17 July 1991. During the build process, British Railway Engineers worked closely with Robert Staveley and Big Country Motioneering. The decision was made partially through the build to modify the track design on the second half of the ride to offer a more thrilling and exhilarating experience. The entire track was machined by Tubular Engineering. The Ultimate weaves and twists its way through 44 acres (178,000 m²) of picturesque North Yorkshire Woodland and takes a whopping 7 minutes and 34 seconds to complete a single circuit of 7,442-foot (2.3 km), of rails at an average speed of 11.2 mph. The ride features two lift hills with the first peaking at a height of 102ft and the second being 140ft. The second hill is in fact 140 feet high if the full gradient of the drop is measured. The ride was built using the highest quality Canadian Redwood Trestles which both support the Ultimate's incredible track length and act as a cushion to soften the ride as they flex with the movement. The Ultimate currently runs two trains on busy days, each of which have a capacity of 38 riders.